Within the last year, the Whitworth School of Business has dramatically increased the amount of experiential learning its students receive. Experience-based business curricula give students the chance to gain exposure to the business world and to develop a professional skill set. Core strengths added to the program include mock interviews with local business leaders, a heavier emphasis on internships, and increased participation in student-run clubs such as the Whitworth Student Investment Group, and in the Inland Northwest Business Plan Competition. The mock interviews are similar to a round of speed-dating. Students and business professionals form groups of five or six, and students spend seven to 10 minutes with each professional at their table. During that time, the businessperson conducts an interview and reviews how each student performed. “It is a great opportunity for students to acquire real-life experience, meet professionals in their desired fields, and get honest feedback on interviewing skills,” says John Burton, a junior economics major and participant in the finance mock interviews. Four mock-interview sessions were held throughout the spring semester. Each session was designed to provide networking for accounting, general business, marketing and finance-focused students. “The School of Business is very excited for our new programming initiatives,” says Sinead Voorhees, internship coordinator for the school. “We have brought over 100 business professionals to campus for our spring mock interviews, while supporting 150 students through the exercise.” Voorhees says these events not only help students; they also leave lasting impressions on the visiting business professionals and returning alumni who participate. Many of the businesspeople have expressed further interest in getting to know Whitworth business students. In addition to setting up the interviews, Voorhees collects information on viable internships, makes students aware of these opportunities, and helps students pursue valuable work experience. Past internships have placed students in local professional environments. For example, Donovan Brogan, a senior accounting major, served as an accounting intern for Northwest Credit Union; Amber Craig, a senior marketing major, interned for Desautel Hege Communications; and Tyler Friends, a junior marketing and finance double major, landed an internship as the social media director for Loran Graham Company. While mock interviews and internships help students gain professional and networking skills, the annual Inland Northwest Business Plan Competition offers undergraduate and graduate students the chance to propose a business plan and actually bring the plan to fruition. This competition calls for creativity, innovation and investment in the community. The competition offers prizes totaling $27,500 in student-generated, social-enterprise, community-based and open categories. Whitworth team “Photoboxx,” led by computer science major Devon Lind, ’14, and local entrepreneur Michael Fisk, placed first in the 2014 open category, while Whitworth team “To You From Me,” comprising School of Business program assistant and graduate student Alisha Shaw, graduate student Krista Dressler, facilities office manager and graduate student Suzanne Sherman, and local business owner Casey Lawrence, took second in the 2014 community-based category. The BPC is a collaboration between Whitworth University, Eastern Washington University, Gonzaga University and Spokane Community Colleges. The Whitworth Student Investment Group was founded in April 2012 by a small number of Whitworth students. 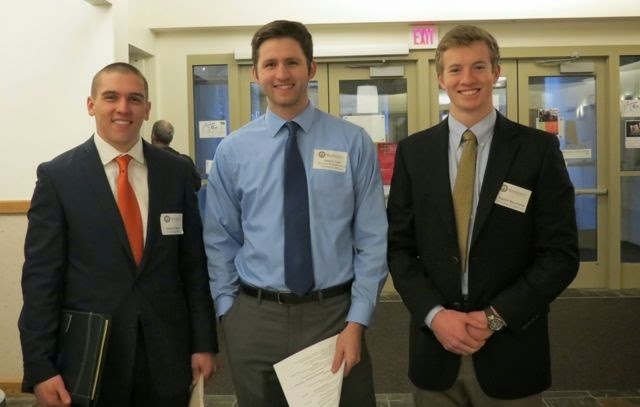 The students designed a proposal for the investment group and presented it to the board of trustees, who, in turn, established the Roblee Roberts Fund to be managed in equities and exchange-traded funds by the group. WSIG’s mission is to “provide students with real-life investing scenarios by actively participating in the trade of securities; to give students the tools to gain exposure to markets and the investing world; and to allow students to influence the management of Whitworth’s financial resources and future.” The returns from the student's investments are returned to the Whitworth endowment.